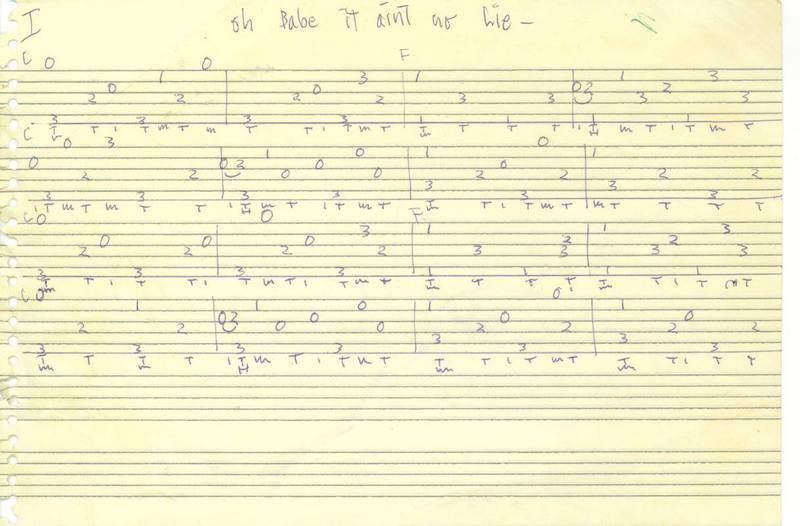 #3 of 7: Jerry's hand-written guitar arrangement in tablature for "Oh Babe It Ain't No Lie"
Anonymous, “#3 of 7: Jerry's hand-written guitar arrangement in tablature for "Oh Babe It Ain't No Lie",” Grateful Dead Archive Online, accessed April 19, 2019, https://www.gdao.org/items/show/1695820. This is one of the songs Jerry taught me when I took guitar lessons from him at Dana Morgan's Music Studio in the Summer of 1962. This is hand-written by Jerry and arranged "on-the-spot".